Your fresh FREE fortnightly fix of gaming goodness is here - and things are heating up for the summer! We go deep behind enemy lines in Middle-earth: Shadow of Mordor and bring you a sizzling first look at Homefront: The Revolution. 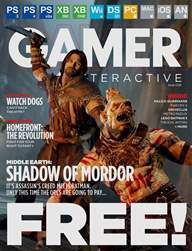 We also have a definitive verdict on Watch Dogs, roadtest DriveClub and the remastered Metro Redux and take a sneak peek at the likes of Halo 5, Far Cry 4 and LEGO Batman 3. So grab it for FREE today!